Thank you so much for taking the time to read our ramblings! Lots more to come in 2019 ! Author ian moorsPosted on December 24, 2018 1 Comment on Merry Christmas! The morning after the ARC+ prize giving bash we headed off to Martinique, a sail of about 28 miles. 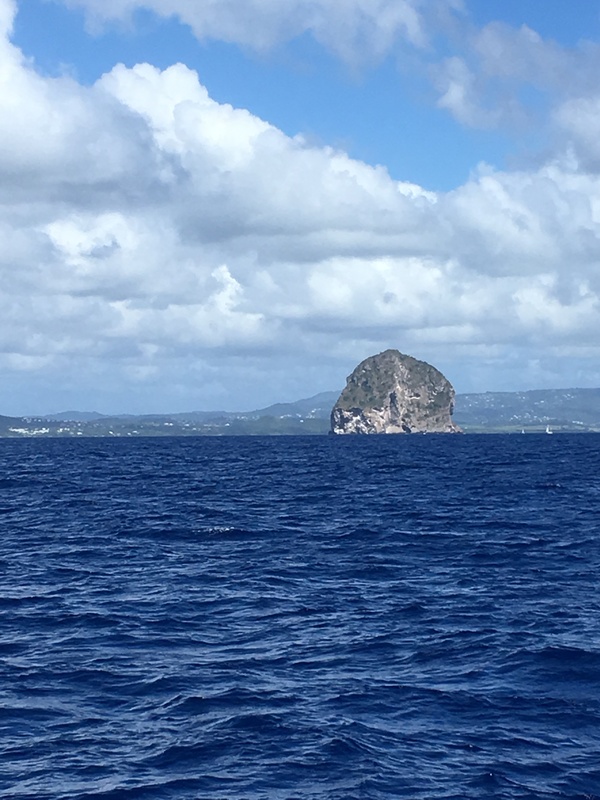 Back to Martinique, & a beautiful sail up to a small bay called anse d’Arlet which reportedly had a cyber station to check into. Once anchored we all went into the small sleepy village to find the cyber base closed even though Doyle’s guide said it should be open… hey it’s the Caribbean. We went back the next morning and the process was self service and cost 3 Euro’s only! Nick & Carol said they’d like to go up to the north of the island to see the town of St Pierre. This area is dominated by mount Pelée, a volcano which last erupted in 1902 killing over 30000 locals There were only 2 survivors. We were a little disappointed with the town to be honest, but there was a well stocked supermarket and local market. 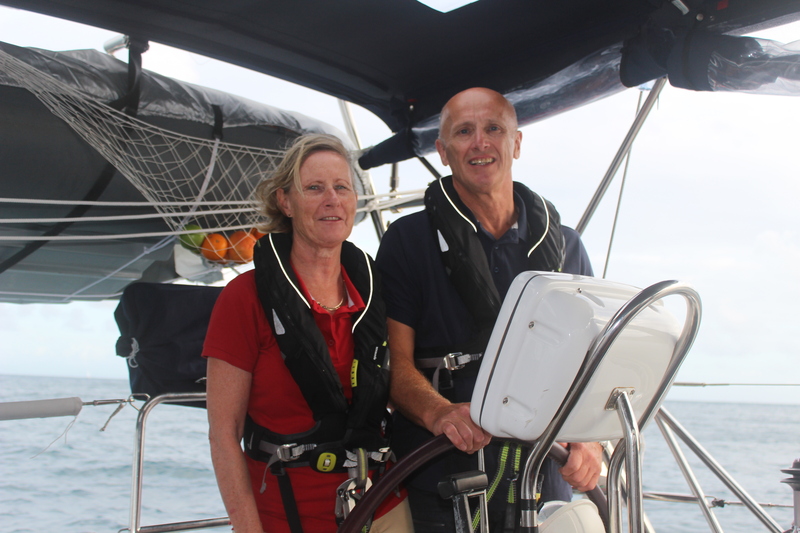 After anchoring for the night we headed back towards Fort de France the islands capital where we would say goodbye to Nick & Carol as they would be flying home. The anchorage isn’t big but is protected from the winds by the fort. However the ferry boat terminal is just behind the anchorage and they leave quite a wake during the day making the anchorage very rolly, but equally calm at night. There’s a really good dinghy dock right by a large park giving easy access to the shops and bars. At 5:30am I took Nick & Carol ashore for their taxi and we said our final goodbyes with hugs and kisses… what an adventure they and we have had together during the last 7 weeks. 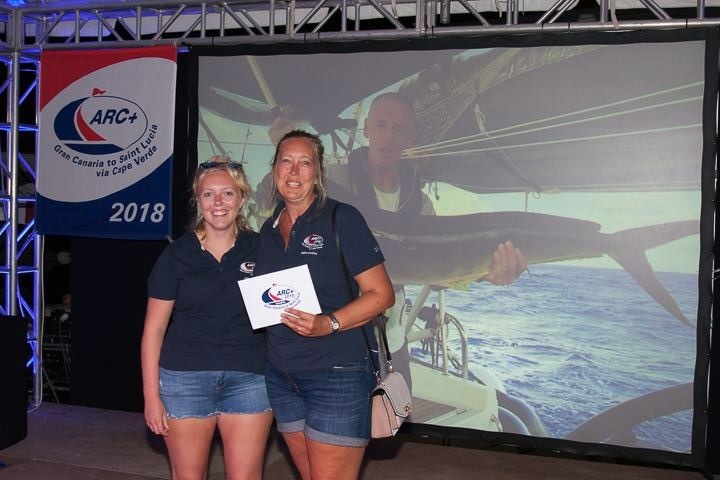 They will have many tales to tell friends and family whilst preparing for their next adventure on their own yacht to the Baltic in 2019. As Christmas is so close, we did a big shop at the Leader Price supermarket in Fort de France which was by far the cheapest place to stock up, then eased back down to Le Marin over a couple of days. On our way south we passed Diamond rock, which has quite the history. The Royal navy “commissioned” the rock calling it HMS Diamond Rock and put cannons and crew permanently on it to upset the French during the Napoleonic wars. It certainly worked and the British held the rock for nearly 2 years before the French finally brought in big ships! Even here we see abandoned yachts, the floating one has no boom, no steering and its anchor chain thick with wee d. The dinghy is also very sad, filled with water and just left. As for the yacht on the beach, it looks like its been there for some time as there’s graffiti all along one side and completely stripped of anything of value! It’s been quite a week since we arrived. Welcoming other yachts in with as much noise as possible regardless of the time of day was great fun and well received by all. One night a yacht was close to the finish line but had a rope around its propellor meaning it couldn’t come in. The ARC have a water taxi available to tow but charge 150 US dollars which we thought unreasonable, so 2 RiBs, ours and the yacht Ithaka along with assistance from Steve on Allegrini went out to bring them into the marina. 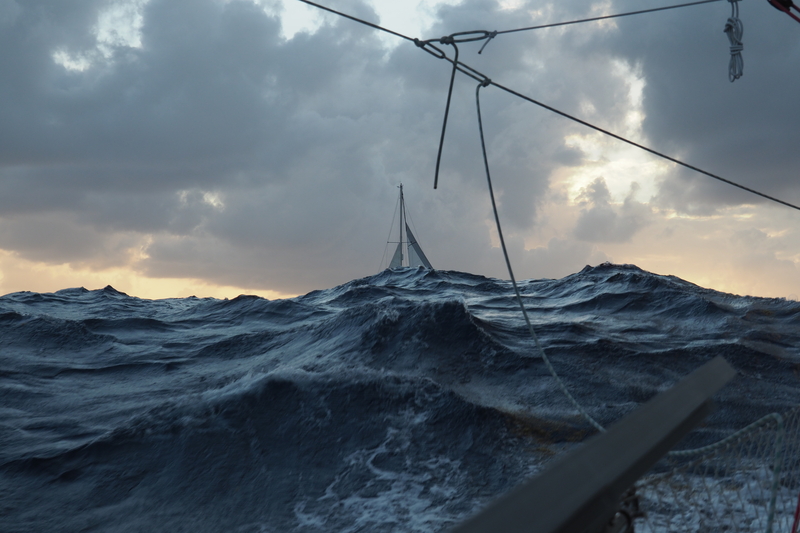 It was much windier than we’d anticipated and once we were tied alongside the yacht our RiBs started filling with water! They’re not going to sink and the water was warm but it did feel like it took a long time to bring them in. 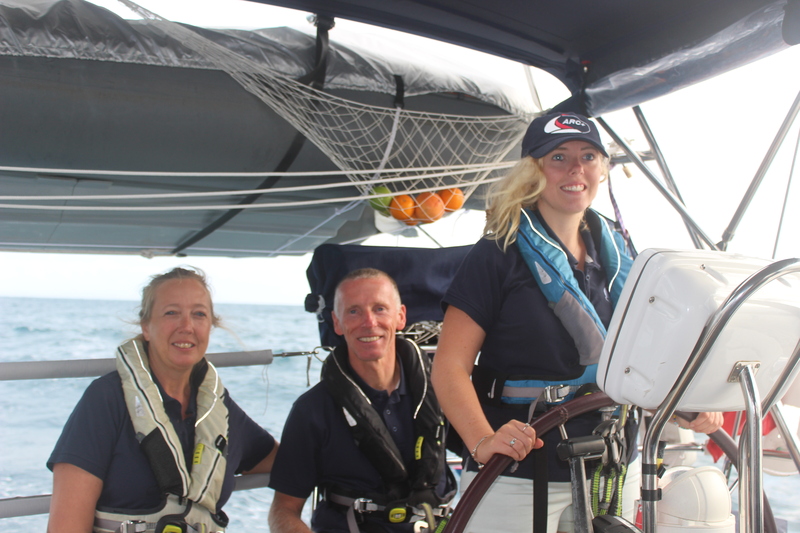 The following day the final yacht arrived to a huge welcome as they were only 2 persons on board with a failed autopilot and damaged rudder meaning they had to hand steer pretty much all the way across the Atlantic!!! 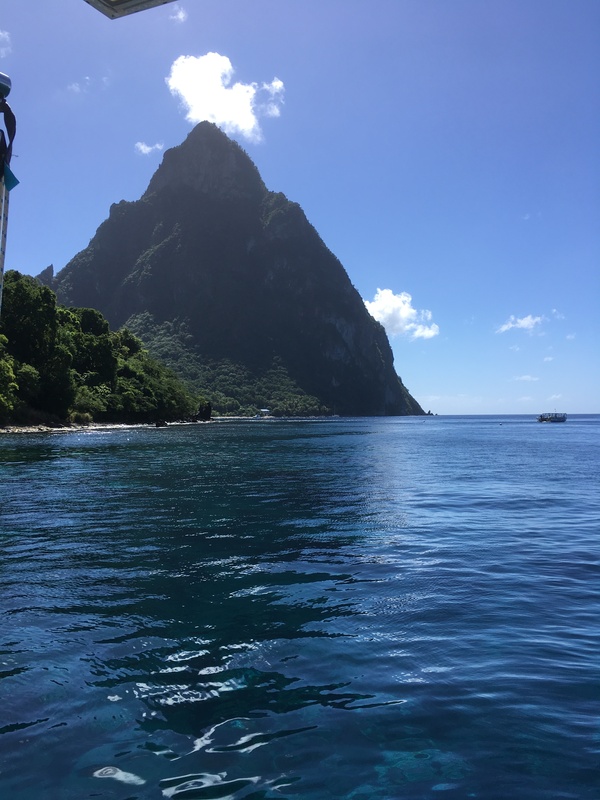 We decided to take a couple of days out before the leaving party & prize giving, so sailed down to the famous Pitons at Soufrierre where we picked up a mooring for $20 US a night…. well the boat boy handed it to us at a cost of 10 EC dollars. It’s only $3 US and we were quite happy. The ladies went off for a day trip to the local mud bath and waterfall leaving the guys to do maintenance, after a sleep and beer of course. On our way back to Rodney bay we stopped at Marigot bay which used to be a very popular hurricane hole, although today insurers won’t cover the area at all. We stopped in the inner lagoon which was so protected and calm. Security is always at the top of conversation in the cruising community, especially where we had been in the last few days but we can only comment on what we found. Boat boys and vendors visit by small boat all the time and are polite and non pushy, we felt quite safe. The next morning we said our goodbyes to many of the friends we’d made along the way knowing that for some we would not see them again as they were on a fixed timescale. For others it was a case of see you for a beer soon! 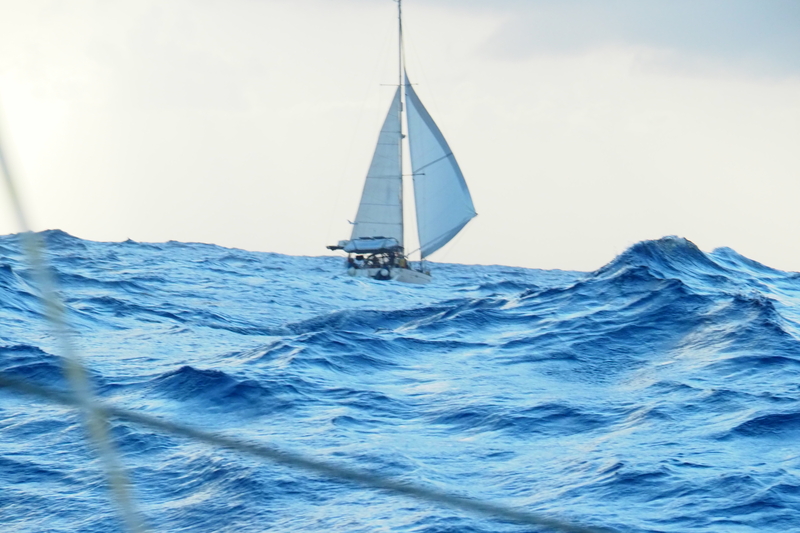 We left Mindelo hoping for a 16 day crossing but had far more wind than we thought we would making for a fast crossing. We don’t think the magnitude of being here in the Caribbean will sink in for some time! 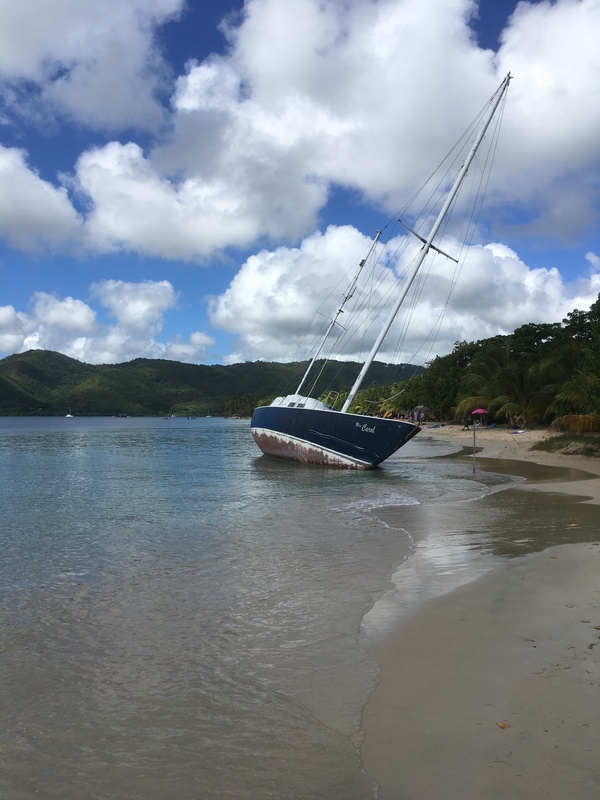 With 2 days to go, we met up with the yacht Mamosa & duly took photos and video of each other, & would swap images once in the marina in Rodney Bay. We wanted to make landfall in daylight mainly for safety but also to see the east and north coastline. 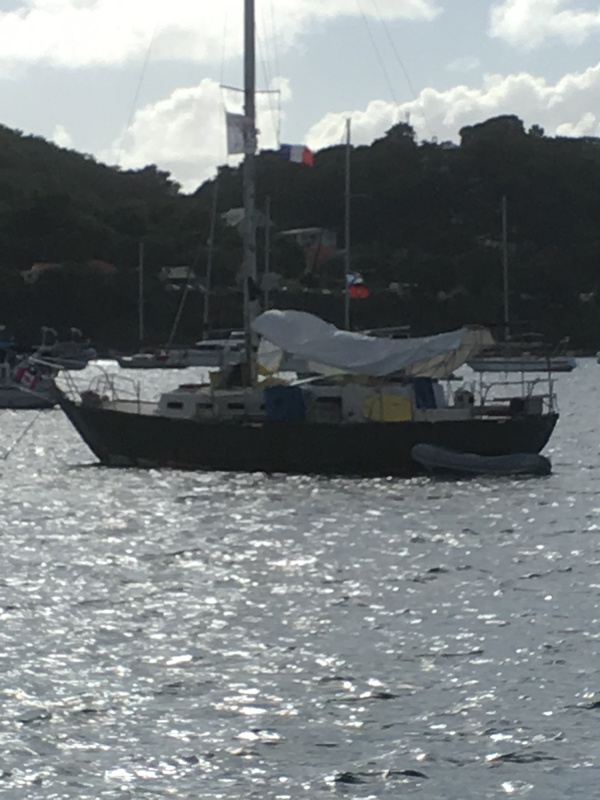 This meant slowing down on our last night so we reduced down to a double reefed mainsail only making about 5 knots in 18 knots of wind. However the Atlantic had other ideas about our speedand gave us a night to remember. At 11pm on my watch the wind suddenly increased to 35 knots and the first of 4 full blown squalls hit with really heavy rain. We’d never seen this before and it was something inbetween exciting and worrying as we had no idea how long each would last. In the end Nick & I stayed in the cockpit all night in case the weather worsened. The Atlantic certainly gave us something to remember. Daylight came and the island of St Lucia, although blanketed in cloud, was a great sight to see. 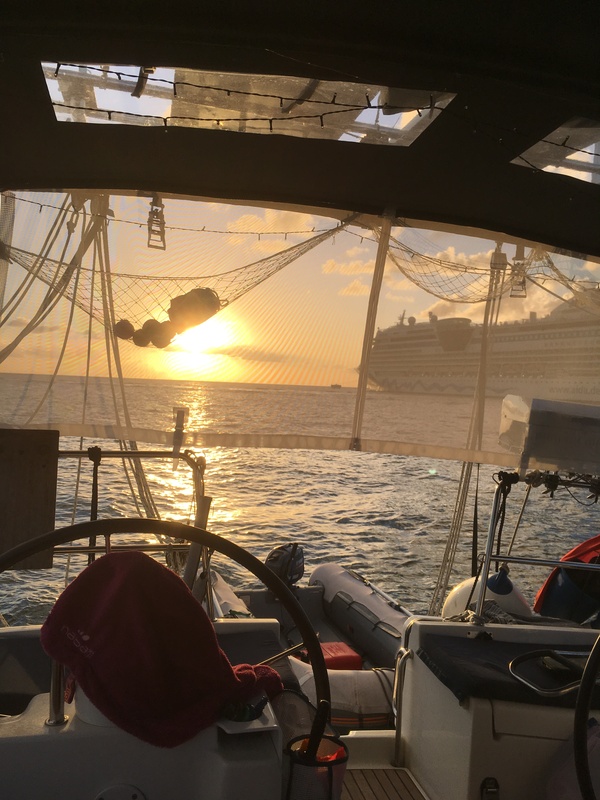 We were welcomed to the Caribbean by a finish line yacht which was a 2017 arc+ yacht, and allocated a berth in the marina. Applause all round, horns sounded from other yachts and the formal process of being handed rum punch and fruit… that tasted so good! We had Suds laundry take away our heavy bulky washing which was returned the same day at a very reasonable price, washed Silhouette and I need to make a note of the items which need looking at on board over the next week or so. Subject to catastrophe we are now starting our last full day at sea . We have about 140 miles to go with already 2021 having passed beneath the keel. Last night was again a great sail with hourly average speeds ranging from 6.9 to 7.3knts and a real roller coaster as we sped into the night. Ian and I have been hand steering through the night, every night to save on the battery power that would been used by the Autohelm. It has been great fun although towards the end of a 4 hour watch the course gets a bit erratic! Yesterday we were slowly overhauled by Mamosa a Norwegean yacht from the rally and just before sun down were close enough to get some great photos of them being thrown around by a confused sea. They were running with full genoa and stay sail poled out and no main compared to our double reefed main and part rolled and poled genoa. The sea has a NE swell running with an E’ly wave pattern on top. It has made the last few days difficult to move about the boat and impossible to stay still. The photos show this really well. Having overtaken us we think Mamosa reduced sail for the night and subsequently slowed down so that we were within a mile of each other over night. Not ideal but now daylight has arrived they are again pulling away. This is likely to be my last blog so I was thinking over night what to write and came up with this drivel. Talking of food,we have had great food throughout, although it turns out Ian doesn’t like my cooking! So thank you to all of the cooks and the procurement officers. The boat has performed very well and despite the amount of stuff on board has shown itself to be a slippery thing through the water. Perhaps the French do know how to build a boat after all. Remember though, many a slip between cup and lip. Having a water maker with a 150 litres per hour capacity has been a real boon. Ian has kept the tanks topped up so that we have been able to do clothes washing and have showers on a regular basis. The less than stable conditions of the last few days has however meant that showering is not practical. Its hard enough to stand up without trying to do it covered in soap! This means using a flannel and having a strip wash. I believe some people call them face clothes but as they are used to wash more than your face it doesn’t seem appropriate. Just remember to start at the top and work your way down. The next day you need to forget where you finished the day before and start at the top again! So to finish the sailing’s been great, the boats been great, the foods been great (come on Ian surprise us and cook a meal) and the company has been great. Thanks Guys. Author ian moorsPosted on December 4, 2018 Leave a comment on Nearly there! Just finished the 4am to 8am shift which has been a blast. The hourly average speed has ranged between 8.1 and 7.0 Knts since midnight with winds ranging between 16 and 22 knts up the chuff. There is a small swell of about 1m and only a slight sea so we are creaming along with single reefed barn doors (see earlier explanation) open . Its a bit overcast this morning but expect this will soon burn off. The weather is warm so that even at 4am it was Tee shirt and shorts. I did my daily rig check just as I came off watch. So far I think that we have had very little damage from chafe as we have everything pulled down quite hard to minimise movement. This morning I found that the split pin that keeps the forestay cotter pin in place had closed up and was in danger of dropping out. This holds the mast up so split pin was given a good talking to and now has its legs well apart. The only other key issue we found a few days ago was the the spinnaker boom track was starting to pull away from the mast due to pressure of holding one of the barn doors open. We have reinforced this with two lashings pulled bar tight on a winch and a webbing ratchet strap also bar tight. So far this temporary repair appears to be working. With only a mere 462 miles to go,(and getting less by the minute) the end is in sight and we have started talking as though the job is done. Quite funny given that until this year none of us had done anything near this kind of mileage. But the old adage “many a slip between cup and lip” should be kept in mind and we should not start to count our chickens until the eggs have hatched otherwise we may find that pride comes before a fall! Talking of cups and slipping, we have a plastic coated apron for the cook to wear while cooking to project them from hot spills which are all too easy on a rocking boat. All good when worn but the other day whilst carrying a cup holder with 4 cups of hot tea a spill occurred whilst not worn. A nasty scald could have been the result had ice not been swiftly applied. Fortunately no permanent damage done and still sufficient ice left for the Pimms and G&T’s. Yes (for all you smart arses) we do use anti spill cups when its rough but tea only tastes good when in a china cup is used so we use these whenever practical. And.. Talking of a rocking boat, have you heard the argument about wether Dire Straits or the Rolling Stones are the best band. Has to be the Rolling Stones in my view but apparently there are some who do not agree. They need educating clearly. Q music………..
It’s hot, damn hot !!! So it appears the huge mahi mahi we caught was in fact a Dorado, fish ID really isn’t our strongest attribute. We now have 550 miles to go. We’ve been surprised by the amount of pull south we have had, which means our diect line to St Lucia would actually end up taking us to Trinidad! Either tomorrow or monday morning we will alter course and take down the poled out genoa. This will mean both sails out on the same sided for the first time since leaving Las Palmas, which should give us a faster sail to the north coast. BTW, yesterday morning a whale popped up alongside no more than 6 feet from us. The crew were very excited but I just wanted it to go away… one gentle flick of its powerful tail could’ve easily damaged our rudder! Author ian moorsPosted on December 1, 2018 Leave a comment on corrections & revelations!